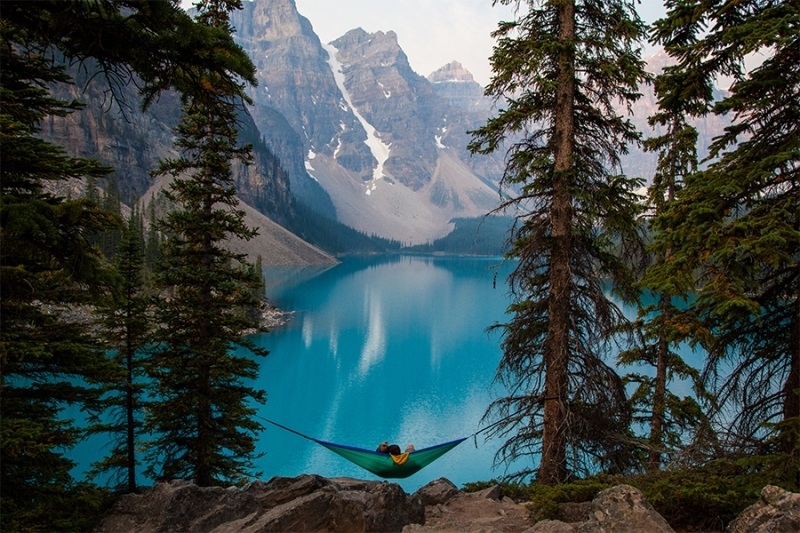 From hiking the mountains to swimming and to craft beer, Banff offers something for everyone. Here in Calgary, we’re lucky to be a short drive away from a place that people travel from all over the world to see. Every Wednesday from May to October, more than 70 vendors are in Banff’s Central Park with local produce, fresh food, and handmade jewelry along with live music by local talent. Hide from the sun on hot days under the gazebos and sitting shelters at this garden just steps away from the main roads in Banff. To make it even better, admission to the garden is free. Banff Canoe Club offers tours on the Bow River where you just might spot an elk, a muskrat, or a beaver while learning about best practices for wildlife interactions. Artist Christine Wingall’s clay sculptures of people she knew in Banff in the 1940s and 1950s is one of the exhibitions at the Whyte Museum of the Canadian Rockies this summer. You can also get New York style pizza and 48 kinds of craft beer. Moose Hotel has not one, but two hot rooftop pools with spectacular mountain views and an outdoor firepit to warm you up. With clear blue waters and never-ending views of the Rockies, Stand Up paddleboarding on one of the many lakes in Banff National Park may just be the most relaxing thing you can do this summer. The Carter-Ryan gallery features the works of Indigenous visual artist Jason Carter. This is the gallery’s second location and opened in 2017. The first location is in Canmore. From Banff Ave. Brewing to Park Distillery, Banff is home to a range of craft beers to try and to take home. Lake Minnewanka is seasonally open and those with a fishing license can take advantage of the largest lake in Banff, which is home to Rocky Mountain whitefish. Crock A Doodle offers drop-in pottery for all ages with no reservation required. They also professionally glaze and kiln-fire the pieces so you get to take them home after. Rocky Mountain Yoga offers all types of yoga classes from yin to flow, as well as meditation sessions. Drop by a class before, in-between, or after other activities in Banff to refresh and relax. Banff Public Library has programming for all ages, including ‘Crafternoon’ for adults every Monday. You can also try other funky drinks like Pineapple Express and Mint Julep. Or stick to a classic Manhattan or Mojito. It may not be Hawaii, but Banff is one of the best places in the world for stargazing. Drive to Two Jack Lake, grab a blanket and a warm beverage and spend the dark hours of the night looking at the clear sky. Award winning and audience favourite films from the 2017 Banff Centre Mountain Film and Book Festival will be screened. Tunnel Mountain is Banff’s smallest summit, meaning that while it may still get your heart rate up, it won’t be too difficult to haul your picnic supplies up the mountain. Up top, you can enjoy breathtaking views of Banff. Johnson Lake is surrounded by a picnic area and low elevation trail. All lakes in Banff are chilly — but within those standards, Johnson Lake is one of the warmer ones. Nourish Bistro also offers cocktails made with fresh, organic ingredients. You can find jewellery, ceramics, and home decor, among other things, made by local artisans. Central Park is the perfect spot for a family picnic with a playground nearby. View of the mountains along the Bow River is just the cherry on top. This scenic run can also take you Vermillion Lakes Road if you’re looking for a tougher workout. You can also take your favourite running body, your dog, on this trail. Located at the Banff Centre for Arts and Creativity, Three Ravens offers fresh food, great wine, and unbeatable views. Canoeing in Banff will never be out of style. And it’s always more fun than you think it will be. You can rent equipments from the Banff Canoe Club. The Grizzly House is considered a classic to many. And rightfully so — the chocolate fondue is one of the best you’ll find. Taking the Banff gondola up Sulfur Mountain is another classic activity. The ride is almost as pretty as the views up top. Cave and Basin is how national parks in Canada got their start. Walk through the tunnels to the cave with only a lantern as your light while learning about the history of Cave and Basin. The Lavender Mule is made with lavender syrup and fresh ginger. If you’re not into lavender, the Block offers a ton of other creative cocktails. You’ve probably walked by Lux Cinema many times. Next time, pop in for an afternoon movie and snacks. The strawberry sauce, crepe dough, apple pie filling and other ingredients at Skokis are all handmade. Both experienced and new climbers can take advantage of Banff’s only indoor climbing facility. You can cool off in the pool, which has clear views of Sulfur Mountain, afterwards. The Banff Centre for Arts and Creativity is hosting an abundance of outdoor music shows for all ages and interests this summer. This local favourite offers $1 drip coffee during its happy hour every morning from 8 a.m. to 10 a.m. This log cabin was built in 1991 and the only way to get to it is through a 16 kilometre hike, horseback ride, or bike ride. Rose & Crown’s newly renovated rooftop patio with a full bar is being re-opened for August. This tour offers pairings of Canadian cheese and wine during an interpretive tour on Lake Minnewanka surrounded by the mountains. Spray River Loop is a good beginner trail, as long as you’re prepared to share the road with horses. You can try mountain-inspired blends in local shop Natur’el Tea. You can catch the sunrise or the sunset by one of the many lakes in Banff. If you’re an experienced hiker, gear up with extra safety equipment and flashlight for a (very) early morning hike up one of the easier trails to catch the sunrise. Banff ATV tours are fully guided to suit various levels of experience and you can pick between full-day and half-day offerings. This Canadian company makes delicious ice cream and adorable cow-themed clothing and accessories. The Banff store is its only one in Alberta. As an alternative to the gondola, take this scenic drive for amazing views of Banff and the mountains. Grab organic, artisan treats at this local favourite that makes fresh bread and pastries each day. If you’re looking to pamper yourself, Banff is home to many world-class spas. Willow Stream Spa at Fairmont Banff Springs is one of the tried and true ones. Choose between one of the hourly or full-day rides, explore scenic trails, and learn about life in the west. The Walter Phillips Gallery in the Banff Centre for Arts and Creativity is a space committed to contemporary art and displays paintings, drawings, sculptures, textiles, photography and much more. Located only 8 kilometers from downtown Banff, this campsite means you can experience solitude but still hop into town for coffee if needed. It’s called Via Ferrata and it takes you through an exhilarating experience along Mount Norquay.